A new rumor has popped up about Ridley Scott's new movie, stating that it will feature his iconic aliens. Who knows what's actually true at this point? It was recently announced that Ridley Scott's Alien prequel wouldn't actually have any real connection to the sci-fi franchise that he helped establish. 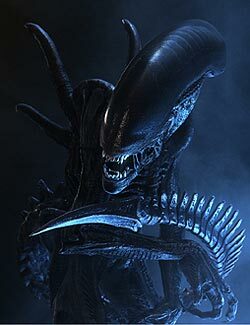 Well, it turns out that may not be the case: Rumors are claiming that the movie will feature the Xenomorph Aliens. According to Sky, a source that's close to the production is claiming, "They've built the 'space jockey' cockpit at Pinewood as seen in the original Alien film, so it definitely takes place in the same world as Alien ... Despite that press release that seemed to indicate there were no aliens in the movie, the familiar HR Giger-style aliens do appear. Big ones, apparently." The movie is also reportedly shooting in Morocco, featuring an archaeological dig that will be a large part of the film's plot. The "Alien DNA" that was mentioned by Ridley Scott in a previous interview might also be a big story element. I'm calling it: There are too many rumors surrounding this film project to figure out what's true and what's not. Ridley Scott clearly needs to just sit down with me for a chat so we can clear everything up and I can get about half my movie collection autographed by the man.